HIGHLIGHTS: The Chattooga River begins in the mountains of North Carolina as small rivulets, nourished by springs and abundant rainfall, high on the slopes of the Appalachian Mountains. The water drops a half mile in elevation over fifty miles as it winds its way to Lake Tugaloo where the river ends between South Carolina and Georgia. The Chattooga is one of the few remaining free-flowing streams in the Southeast, and the setting is primitive with dense forests and undeveloped shorelines on most of its route. The Chattooga River Trail is a forty mile route that borders the states of North Carolina, South Carolina, and Georgia and follows the banks of the Chattooga National Wild And Scenic River from Burrell’s Ford to US 76. Congress designated the river on May 10, 1974 and it is often used by kayakers, hikers, backpackers, and fisherman as it winds from the North Carolina mountains to Lake Tugaloo. The Chattooga River Trail shares its pathway with both the Foothills and Bartram Trails in the Russell Bridge area, but it stays close to the river for its entire distance unlike the other major southeastern trails. This is the northernmost section of the Chattooga River Trail and it leads to a well-known historic landmark called Ellicott Rock. Andrew Ellicott, a noted surveyor, was commissioned by North Carolina and Georgia to determine the boundary between the states. He completed his survey in 1811 by chiseling an inconspicuous mark on a rock on the east bank of the Chattooga River. This rock is found inside the Ellicott Rock Wilderness, and it is named Ellicott Rock after its founder. Congress established the 3,300 acre Ellicott Rock Wilderness in 1975. They made additions to the wilderness in 1984 and it now contains 9,012 acres in North Carolina, South Carolina, and Georgia. The wilderness straddles the 15,432 acre Chattooga Wild and Scenic River Corridor, providing a large undeveloped land area within easy driving distance for millions of Americans. The primary trailhead to Ellicott Rock is located on the right about a quarter mile from the Burrell’s Ford Parking Area and down the gravel Forest Road 708 in South Carolina. (An alternate trailhead is at the lesser used Bad Creek Access Trail). If approached from Forest Road 646 in Georgia, Burrell’s Ford Parking Area is on the left just after the wooden bridge over the Chattooga River. 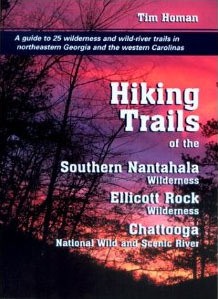 The hike to Ellicott Rock follows the Chattooga River Trail about three miles to the historic boundary mark. Along the way, there are plenty of opportunities for fishing and swimming. Make sure to stop and see Spoonauger Falls as well. The short side hike is well worth the effort and you will see the 0.3 mile Spoonauger Falls Trail almost immediately after you leave the trailhead at Forest Road 708. There are numerous sites along the water, and this hike can be done as either a day or an overnight trip.